The average cost of assisted living in Hattiesburg is $2,925 per month. This is lower than the national median of $3,346. To help you with your search, browse the 25 reviews below for assisted living facilities in Hattiesburg. On average, consumers rate assisted living in Hattiesburg 4.2 out of 5 stars. Caring.com has helped thousands of families find high-quality senior care. To speak with one of our Family Advisors about assisted living options and costs in Hattiesburg, call (855) 863-8283. Hattiesburg is a small city in Forrest County, Mississippi, with plenty of historic appeal. Downtown Hattiesburg spans 23 blocks and appears on the National Register of Historic Places (NHRP), boasting an active neighborhood association that hosts annual community events and celebrations. Assisted living in Hattiesburg is regulated by the Mississippi Department of Health’s Division of Health Facilities Licensure and Certification. Prior to or at the time of admission, assisted living facilities must provide a resident agreement that details costs, services and policies. There are five assisted living communities in Hattiesburg from which seniors can choose. Hattiesburg has plenty of entertainment options for seniors. Assisted living facilities may offer supervised outings to destinations like the Museum of Art at the University of Southern Mississippi, where admission is free. Hattiesburg also has the Turtle Creek 9 theater, where seniors get discounted ticket rates. Seniors may find Hattiesburg to be an affordable place to live. The cost of living in Hattiesburg is ranked 89.2, which is lower than the overall U.S. average of 100. Assisted living monthly costs, healthcare, groceries and transportation may be cheaper in Hattiesburg than some other U.S. cities. The Hattiesburg area is home to world-class medical facilities, including Forrest General Hospital and Merit Health Wesley, in the event of medical emergencies or illness. Hattiesburg has a property crime rate rating of 61.5, which is higher than the national average of 38.1. This means seniors may be at a slightly higher risk of property theft, although assisted living communities take measures to keep residents safe. Hattiesburg has an average of 220 sunny days per year, which is more than the national average. However, summers may be uncomfortably hot, as the city has an average July high of 92 degrees Fahrenheit. The air quality rating in Hattiesburg is 44, which is lower than the U.S. average of 58. This figure is based on data from the National Air Toxics Assessment, an EPA program that analyzes pollutants and risks for U.S. zip codes. Assisted Living costs in Hattiesburg start around $2,925 per month on average, while the nationwide average cost of assisted living is $4,000 per month, according to the latest figures from Genworth’s Cost of Care Survey. It’s important to note that assisted living rates in Hattiesburg and the surrounding suburbs can vary widely based on factors such as location, the level of care needed, apartment size and the types of amenities offered at each community. 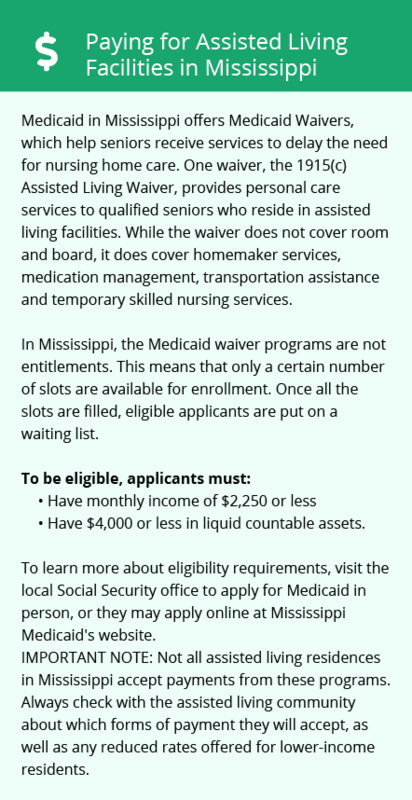 Seniors in Hattiesburg who meet eligibility requirements may qualify for programs that help cover assisted living costs. 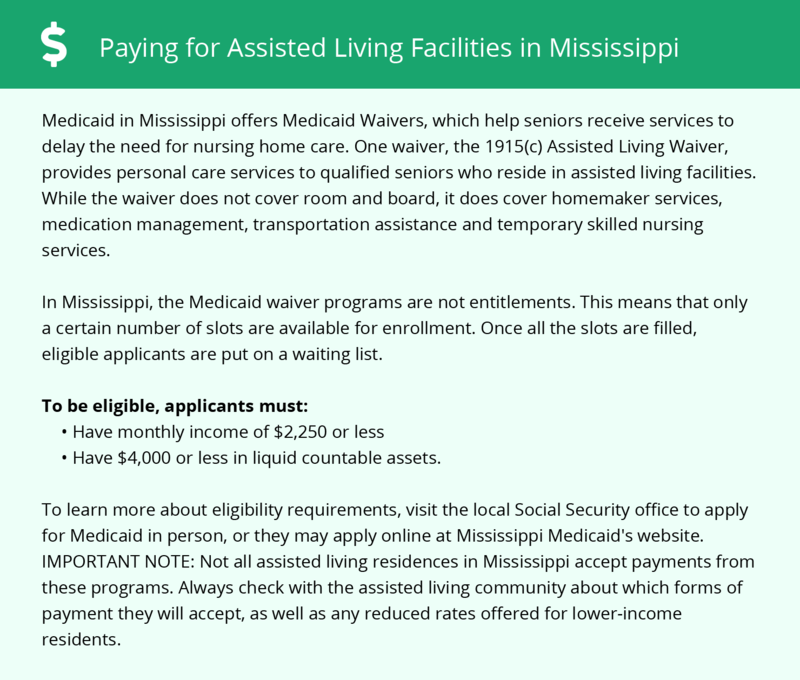 One such assistance program is the Assisted Living Waiver, which is offered through Mississippi Medicaid. To see a list of free assisted living resources in Hattiesburg, please visit our Assisted Living in Mississippi page. Hattiesburg-area assisted living communities must adhere to the comprehensive set of state laws and regulations that all assisted living communities in Mississippi are required to follow. Visit our Assisted Living in Mississippi page for more information about these laws.